Although the ceremony is the most important part of your wedding, the reception is what most people look forward to. It gives your guests a chance to connect with each other and receptions are filled with good music, food, and activities. We have put together our favorite reception ideas that you can incorporate if you want to add a bit of pizzazz to your special day. As guests enter the reception area, have a special area set up with a unique guest book. Traditional wedding guestbooks often get tossed into a random drawer or tucked away forever so it's a great idea to get a bit creative and come up with a useful guest book. 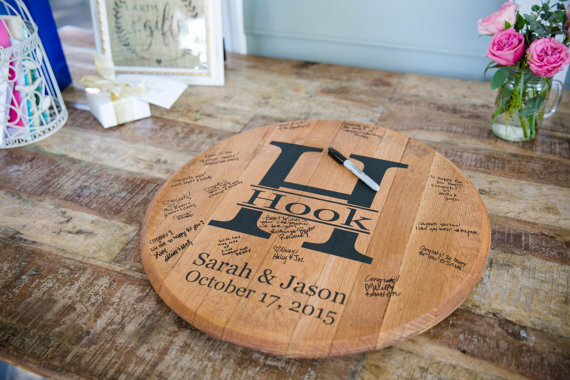 Whether you have guests sign a giant wooden letter to signify your last name, have guests take polaroid photos and put them in a book, or have your guests write their names and a memento on Jenga pieces, make sure you incorporate something that is meaningful to you. You can order a personalized guest book here. When you send out your wedding invitations, leave an area on the invitation for your friends and family to write their favorite songs. All of these songs can then be added to your playlist if you're DIY-ing your music or you can create a list of everyone's favs to give to your DJ to play. Everyone will love hearing their song submissions being played and it will really get the party going! Who said the food has to stop when the cake gets eaten? Keep the food coming for your guests in between meals or after. Your dancing guests will appreciate it! As the night goes on, arrange to have a midnight snack of pizza, tacos, fruit and veggie platters, or mini burgers. Aside from the food, music, and people, entertainment is probably the most important aspect that goes into the reception. Whether you want to hire a group of belly-dancers or rent a photo booth, having something unique to entertain your guests will ensure your wedding will be talked about for years to come. 5.) Go out with a boom! Make a lasting impression as you leave your guests for the night by having a sparkler exit, surprise fireworks, or floating lanterns for your friends and family. Not only would these be a unique surprise, they are also a great photo opportunity. If you're interested in purchasing sparklers for your send-off, you can find some here. If you're interested in adding a photo to your big day, you can find more about the features we offer here and you can check your date below!